The morning mist came early today. Shaking off the sleep in the eyes, I began to feel the cool chill of the air surrounding the lake. With such cold temperatures, it was understandable that the usual cacophony of whining insects was muted this morning. I have always enjoyed mornings such as this. I particularly enjoy watching the trees quiver in the ripples caused by the fishes surfacing to take a peek at what we’re doing. As the surface calms again, the enormity of the lake becomes ever so apparent. “These bleeding cows really own the road.” I sighed more to myself than my pillion as I slowed to a crawl just in case another one of these cows decide to dash across the road to get their daily dose of greens. 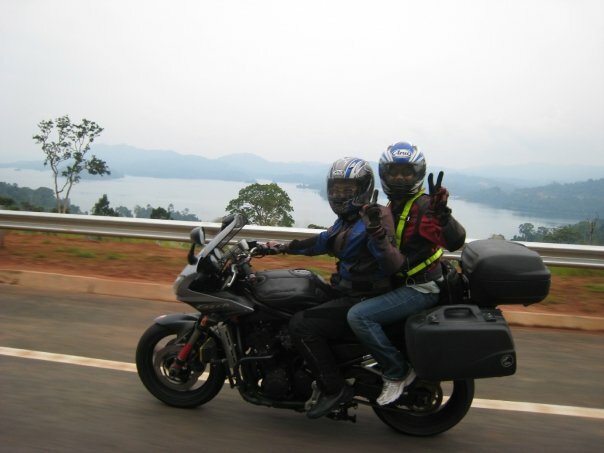 It was Day 2 into our ride travelling from Singapore (South) to Lake Kenyir (East Malaysia) in Terengganu and then to Lake Temenggor (West) in Perak and it was stifling hot! I bet you’re wondering “Why this theme for the ride?” Well, besides enjoying the great natural beauty of Malaysia, we also wanted to burn some rubbers in the wonderful twisties at Simpang Pulai and the Gerik Highway, of course! The night before, the info tag tells us to endure a gruelling fifteen hours on the roads for the first day, something that the regulars were pretty familiar with. But unknown to the masses, the organisers were particularly worried about the condition of the riders as we needed to make haste to reach our first destination in good time – always a concern when dealing with large groups. Special attention was paid to the riders who have not experienced such long hours on the roads before and I’m sure they were grateful for the advice the steel butters gave so willingly days before the ride. As with any clubs, there is always the danger of over-enthusiastic members signing up and realising that they’re not prepared for it midway through the ride, especially the newer riders. Not very safe, me thinks…and something I’m glad the club addressed. Tasik Kenyir is situated in the state of Terengganu, with the waters just north of the Taman Negara National Park. Well known for its tranquil waters, sport fishing and collection of close to 340 islands, South East Asia’s largest man-made lake has much to offer for people itching to leave the hustle and bustle of city life. Being situated near the mountainous regions of Malaysia’s interior, the roads leading to Tasik Kenyir is captivating, to say the least. Exiting at Simpang Pulai from the North-South highway, the throttle just became heavier as the sight of the first corner entered my visor. That is not to say the ride to the Tapah R&R was without incident. Of all people in the group, Rosli, our resident mechanic’s tire valve picked the most fortunate time to blow up; in the petrol station. The cracked up faces of the riders belie a huge sigh of relief. If the tire valve blew up halfway while riding, the look of the totally flat tire wouldn’t be so hilarious to us anymore. Blessed with such luck and a slight tinge of irony (it just had to be Rosli! ), the main group left for breakfast somewhere near Cameron Highlands while Rosli, me and another rider headed to Tapah town to look for a tire valve. The Malaysian mechanics watch in awe as Rosli took the few simple tools they have and set to do his work on his tire. It wasn’t fun prying the tire out to stick the blown valve in, but hey, as long as we get moving to the twisties soon, I don’t hear any complains! The new roads to Gua Musang consist of large sweeping bends with the roads opening up to 2 lanes at times. From the oh so cool air at Simpang Pulai to the picturesque scenery en-route to Gua Musang, avid riders would be delighted with scrapping foot pegs and making the money you spent on tyres worth it, utilising every inch of thread you can possibly find. The crowd were whooping and grinning after the nice ride but I’m pretty sure some would never expect how the next stretch of roads will be like! Route 8 from Gua Musang to Kuala Krai is straightforward enough, being a major transport route to the cities up north. A right turn out of Route 8 heading east brought us through a FELDA (Federal Land Development Authority) plot of land reserved for oil palm plantations. For the uninitiated, FELDA routes are notoriously unkempt as these roads are only usually open to the loads of trucks picking up Malaysia’s precious cargo. Trawling through gravel and sand, you could almost hear the nervousness of the riders as they negotiate their way out of the sticky, or more accurately, slippery situations. What’s worse was the road block of sand and gravel, forcing us to carefully tread through a route of only about half a metre wide, with a drop of almost 2 metres down one side and an imposing lump of gravel and soil on the other! Hit your box on the gravel and down 2 metres u go on the other side! don’t look down! don’t look down! Surprisingly, this route is marked T156 on the GPS and is scheduled to perform its role linking the west and eastern portions of northern Malaysia until a larger highway is completed. Before long, we hit the half built highway. Skirting Tasik Kenyir with the dark, new tarmac, coupled with a darkening sky and the still waters of Kenyir on your right, riding through this region makes you feel as though you were riding through an European mountain pass in summer. “Wah lau! I almost whacked that toman’s head!” I yelled as I grabbed another stone, hoping to strike it and make it groggy enough for me to take a picture. “Don’t be stupid la. How to knock out a fish like that.” came my girlfriend’s unflattering comment, revealing once again my extreme stupidity, as I dejectedly walked back into our room as she admired the scenery from the balcony. Relocation of elephants also take place in the lush reserve of Tasik Kenyir. These saved elephants are probably caught causing mischief in areas that can be as far away as Selangor and brought up to the reserve as part of conservation efforts. 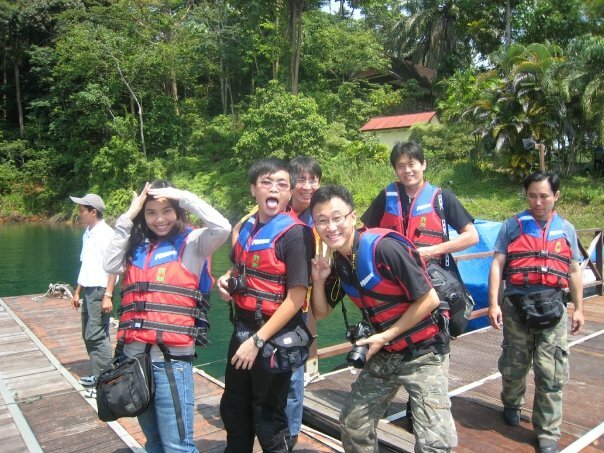 Tasik Kenyir Resort and Spa is the only resort on the mainland, albeit a very comfortable and quiet resort. The accommodations in Kenyir are a mix of boathouses and resorts spread throughout the 340 islands in Tasik Kenyir itself. Serious anglers rent boathouses to go for fishing expeditions for a few days in a row, doing practically everything on the boat while city slickers lounge around in the balconies of their resort, absorbing the peace of nature. It is quite hard to imagine that the islands were once hilltops and highlands before humans starting flooding the place for a dam. The vanishing pool is a prime attraction of the resort, offering a vast panoramic of the lake. Nonetheless, we were grateful for the serenity and peacefulness of the place. You could throw your troubles into the waters of Kenyir and it’ll probably stick there for the rest of its miserable life while you get on with yours. A blissful sight to end the day with. The next morning was something of a rush. Beer went down well the night before but got so stuck in the head and refused to carry me out of bed. While I can vaguely hear the camera clicking in the balcony, I chose to bury my head below the pillow until I remembered that we’re supposed to be in the pool early in the morning!! It was also decided that we go for a short boat ride to better appreciate the area we were staying in. We would have loved to go for their numerous waterfalls, of which the Lasir Waterfall is reputed to be the most beautiful. This would have been a beautiful sight for the locals after an ardous climb up before they dammed up the place. All aboard as we climbed in….. The tips of once mighty trees are the only ones embracing the warm sunshine. The surprising thing is that the timber that are at least 5 metres from the surface is still strong and European submariners come down once every few months in their submersible to log them! Today’s ride was delayed due to the boat ride but we are looking forward to it as we’ll be riding through some of Malaysia’s most scenic routes, Route 4 or more affectionately known as the Gerik Highway. Indeed, some of my best riding memories in Malaysia came from this highway; where else could you say you saw a wild elephant by the side of the road! And since we’re so close to the east coast, we snaked our way out and had lunch in the quiet outskirts of Kuala Terengganu. The beach is surprisingly quiet, perhaps the road works nearby dampening people’s will to come, but it was more likely the weather. The weather so far had been unbearingly hot. The humidity and heat makes me wish we were on the move more….. Enjoying the hardly breezy breeze…as much as there was cloud cover, the heat was stifling! The ride to Jeli is to ride to the head of the Titiwangsa range in Malaysia, or what trekking aficionados call the “Roof of Malaya”. It, according to my all time favourite information website Wikipedia, forms the backbone to the Malaysian interior and is the source of seven of Peninsula Malaysia’s highest peaks above 2000 metres, including Gunung Korbu (Malaysia’s 2nd highest peak – a mere 3 metres shorter) and Gunung Brinchang of the immensely popular Cameron Highlands. Unsurprisingly, this range is home to some of the oldest tropical rainforest in the world. We are indeed lucky to be still able to enjoy its natural wonders and we hope it would be much of the same 100 years down the road. Besides the primary rainforest, we get to enjoy roads just like the Monaco Grand Prix! As the sky darkens, so did the worry levels as it would probably mean riding in pitch black conditions around twisty trunk roads. We had enjoyed too much during the day and eaten into our itinerary. 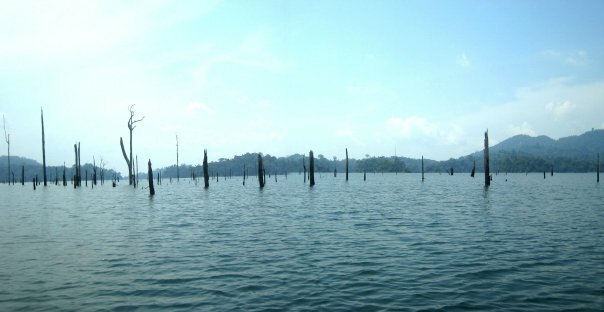 at least we had a stunning view of Tasik Banding before it all turned dark! Riding through Pulau Banding and the equally immense Tasik Temenggor, we headed on, riding almost 2 hours at night to Lenggong to dinner and a well deserved dinner and rest. The weather was equally unrelenting, even on the third day. By now, rashes are forming on my legs as the heat continued to wreck havoc to our body systems. It was really a joy to then head on to a waterfall nearby to dip those heated legs into some cool waters after a hearty breakfast. The time to head on back to Singapore was nigh and while I was raring to get back onto the roads to get some air circulation in, thoughts of files of work sicken me. At least, we had a good dinner at an air-conditioned restaurant that sells herbal tea and other health stuff near Pagoh. The lads and their pillions were also stoning out by now, giddy with euphoria from the ride, nauseous with a stuffed belly and at least for me, cringing at the thought of emails the next day. 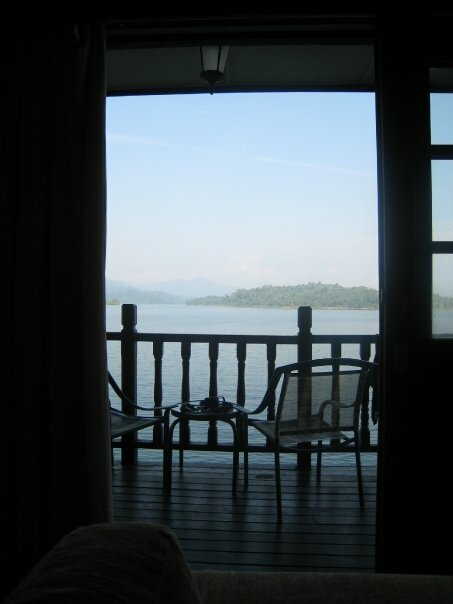 I should get a lake house soon…at Tasik Kenyir….and my thoughts wander. Or maybe I should get an MC tomorrow. I sure hope my boss don’t read this…….